Shawn Robare over at Branded in the ’80s is reviewing his trip to the World of Coke in Atlanta and it got me thinking about the Cola Wars of the ’80s. More specifically, soda commercials I loved during the Cola Wars. I love the battle between Coke and Pepsi during the end of the last century. So much awesome merchandising and memorabilia come out of that time period it’s mind boggling. Both Coke and Pepsi unleashed on our consciousness oodles of celebrities, pop songs, commercials and advertising that sculpted our current pop culture consciousness and is still remembered today. 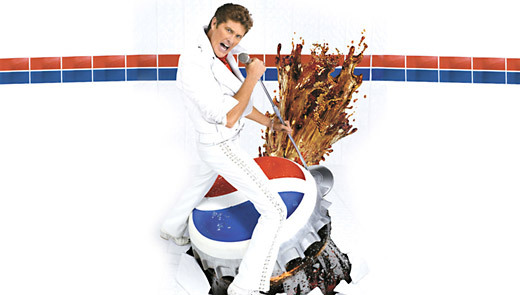 Let’s take a look back at some of Pepsi’s best soda commercials. Just this past weekend I watched Michael Jackson’s This Is It on Blu-Ray and loved it. The man new how to perform and he had SO MANY good songs. In the ’80s Michael was a pretty big spokesman for Pepsi and made several commercials (one in which he famously caught on fire). For me, one of the best, if not THE best, Pepsi commercial ever made was Jackson Street (clip above), which premiered on the 1983 Motown 25 TV Special. I still get goosebumps when I watch it. This commercial featured an unbelievably catchy jingle-version of Billie Jean. It also starred a young Alfonso Ribeiro (Carlton on The Fresh Prince of Bel-Air). See another Pepsi commercial MJ made called The Chase. Ray Charles’ “Uh-Huh” commercials were all over the place in the early ’90s. They had 6 or 7 versions of them including Ray in a courtroom and playing his twin brother, Irv. My favorite version came in 1993 which showed other celebrities (Charo, Tiny Tim, Bo Jackson, Jerry Lewis) auditioning for Ray’s singing part. Around the time Michael Jackson was a Pepsi spokesman, another Michael (J. Fox) was also signed on. Fox starred in several commercials, mainly for Diet Pepsi, that are considered classics. The commercial above is one of his first featuring him in the library trying to be quiet while buying a Pepsi from a vending machine. See another Pepsi classic called My New Neighbor here in which Fox tries desperately to find his hot, new neighbor a Diet Pepsi. Cindy Crawford’s “Just One Look” commercial is iconic. It’s a perfect time capsule for the ’90s. It was so iconic they created a sequel for the commercial 10 years later. And Cindy looks just as good in the new one as she did in the old one. Cindy did several commercials for Pepsi including this one with Michael Richards and Rodney Dangerfield. In the ’90s, Pepsi started their Generation Next campaign with the Spice Girls. I really liked this commercial because I liked the song, Generation Next, that it was based on. The Spice Girls only did 2 or 3 commercials for Pepsi. Here’s another Pepsi commercial the Spice Girls did using the same music. Britney Spears’ Pepsi commercials were pretty awesome. The Super Bowl commercial above, Millenium, is probably my favorite of the dozen or so Britney commercials that were made. Some other good ones include the Pepsi Twist commercial with Austin Powers and the “We Will Rock You” commercial with Pink and Beyonce. Okay, no look back at iconic Pepsi commercials is complete without looking at the Crystal Pepsi commercial featuring the Van Halen song, “Right Now”. It was a Super Bowl commercial and it announced Crystal Pepsi to the world. So those are some of the most popular Pepsi commercials ever made. Check back tomorrow as I look at some of Coke’s awesome vintage commercials. This entry was posted on February 25, 2010 at 12:00 pm and is filed under 80s, advertising, commercials, Michael Jackson, Pepsi, pop culture, soda, TV with tags advertising, commercials, Michael Jackson, nostalgia, Pepsi, pop culture, soda, sodapalooza, TV. You can follow any responses to this entry through the RSS 2.0 feed. You can leave a response, or trackback from your own site. Those are some great commericals! I remember the Britney one and the Cindy Crawford one too. My favorites? The Michael J. Fox ads, followed by Michael Jackson. I found a 1957 pepsi commercial reel, looking at it this weekend.